When I click Send Selected Slides..., Request Support... or Invite to think-cell trial..., think-cell displays an error message saying "think-cell has not been authorized to send mail" and a link to this article. On macOS 10.14 and later, macOS asks if you want to authorize PowerPoint or Excel to send Apple Events to Mail. You may have denied this request in the past. To authorize think-cell on macOS 10.14.2 and later, tick the Mail checkbox in System Preferences → Security & Privacy → Automation. In the Finder, go to Applications and then Utilities. Now open PowerPoint and click on Send Selected Slides..., Request Support... or Invite to think-cell trial... again. 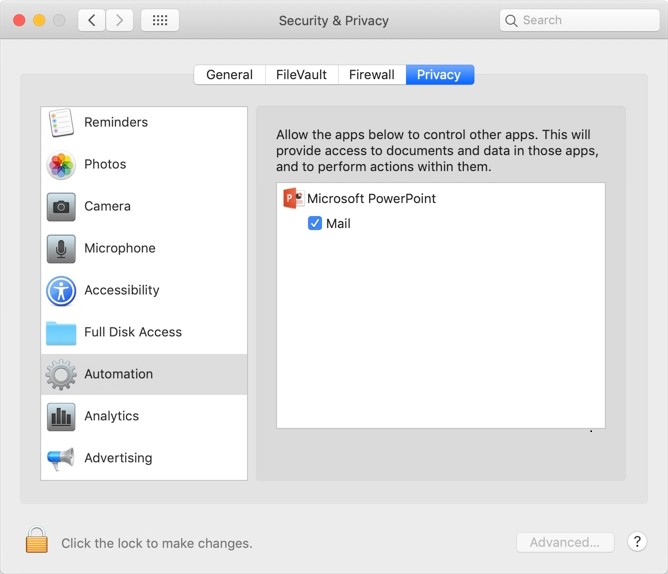 A message box will appear saying "Microsoft PowerPoint" wants access to control "Mail". Allowing control will provide access to documents and data in "Mail", and to perform actions within that app. Press OK to confirm.